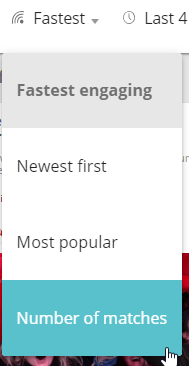 The default sort ordering for Newswire stories is Fastest Engaging. Stories getting the most engagement (likes, comments, shares etc) will appear first. You can also choose to order by matches - the stories that have been used by the highest number of outlets. To switch to this view, change the default sorting method to "Number of matches". The top-level storycard view shows the number of matches in the bottom right. 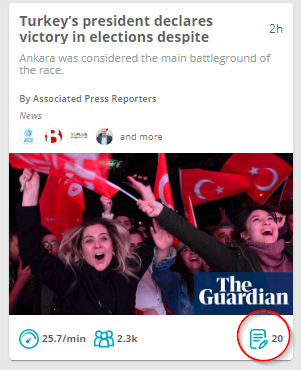 By clicking on any story, you'll open up a more detailed breakdown of the outlets that have used your story and the amount of engagement each outlet is picking up.